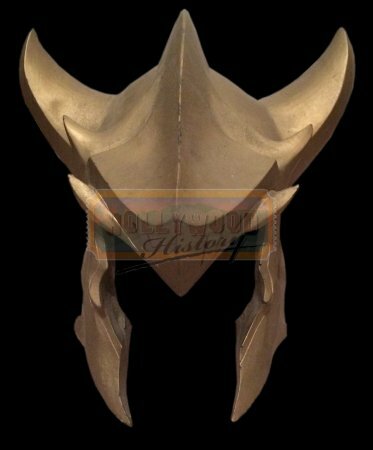 Goldar's Helmet [MMPRGH] - $0.00 : Hollywood History Online, Discover the Magic and Bring Hollywood Home! Six teenagers have discovered the power to fight the forces of evil. Now the fate of the universe is in their hands. Goldar a lion-faced, griffin-themed knight who is the second-in-command for both Rita Repulsa and Lord Zedd. 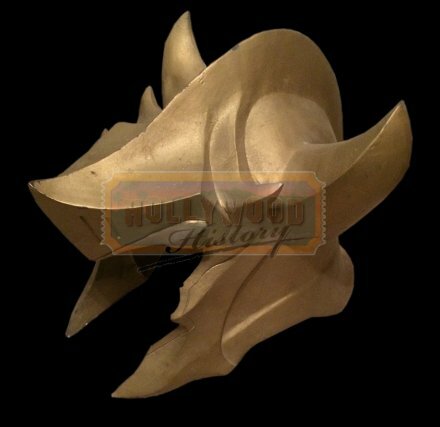 This is Goldar’s Helmet used in the 1995 film,Mighty Morphin Power Rangers: The Movie, Goldar serves Lord Zedd and Rita Repulsa, but when Ivan Ooze shows up, Mordant and he switch sides almost automatically after Ooze traps both Rita and Zedd in a snow globe, depriving them of their powers. He thinks Kimberly is cute, and when the time comes, he flies away as Ivan takes Angel Grove Tower out of the Ground. In this film, he is portrayed as a bumbling sidekick, very similar to Squatt in the main series. At the very end following Ivan Ooze's destruction, Goldar had taken over the palace and calls himself King Goldar.